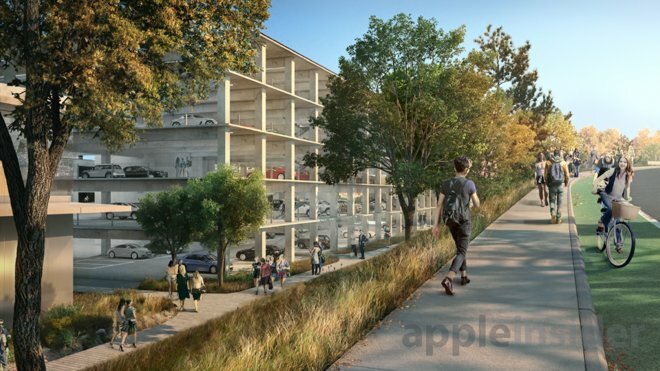 Apple is moving forward with advanced plans for Phase 2 of its ambitious Campus 2 project, including testing workshops and research and development facilities with enough room to develop and test new products the size of an automobile. 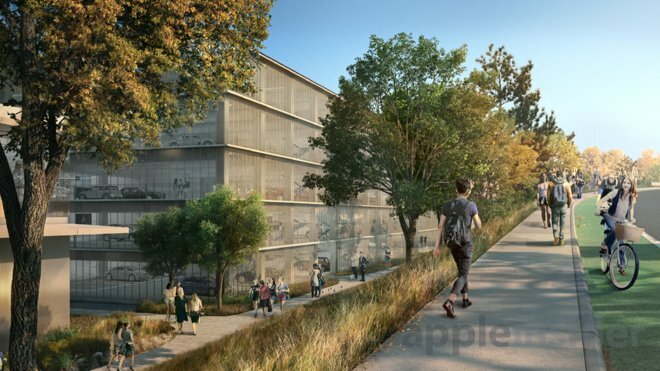 Apple Campus 2 is just beginning to rise, but a modified Phase 2 development envisions additional buildings on the site, echoing the clean, simple lines and glass walls of the central "Spaceship" Ring. Originally, this secondary development was portrayed as ten square buildings on either side of Tantau, along with one larger rectangular building (as depicted below). 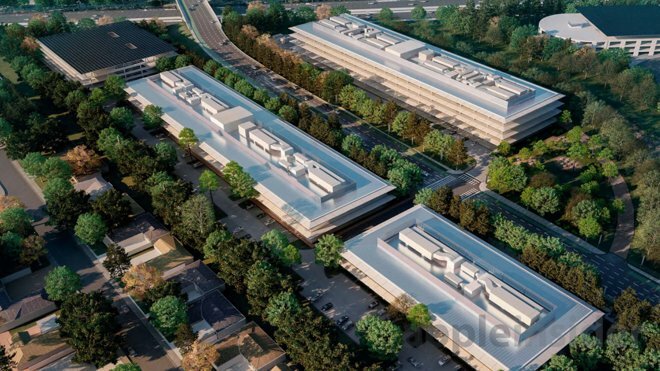 Apple's revamped plans for Phase 2 merge these boxes together into fewer, larger office buildings, with a dedicated parking structure that also incorporates racks of servers in an on-site data center. 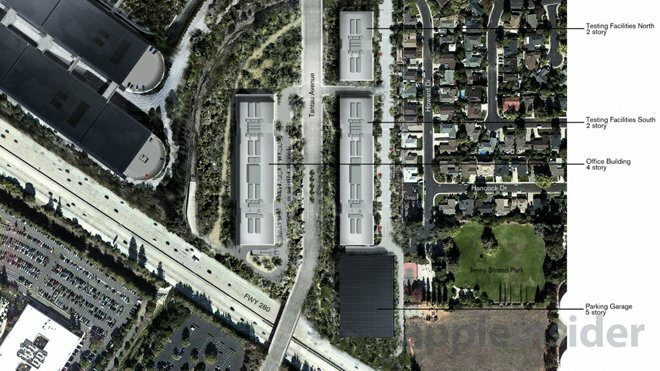 The timing of this Phase 2 redesign correlates with Apple's reported moves to focus on development of an automotive product. AppleInsider outlined the company's automotive industry inclinations back in 2012, but recent mainstream media reports that suggest the company plans to develop an entire vehicle are relatively new. The Phase 2 site's former 103,000 square feet of office space at Ridgeview Court 1 (below) was demolished over the past month. Expansive surface parking lots previously covered most of the open land surrounding the buildings. 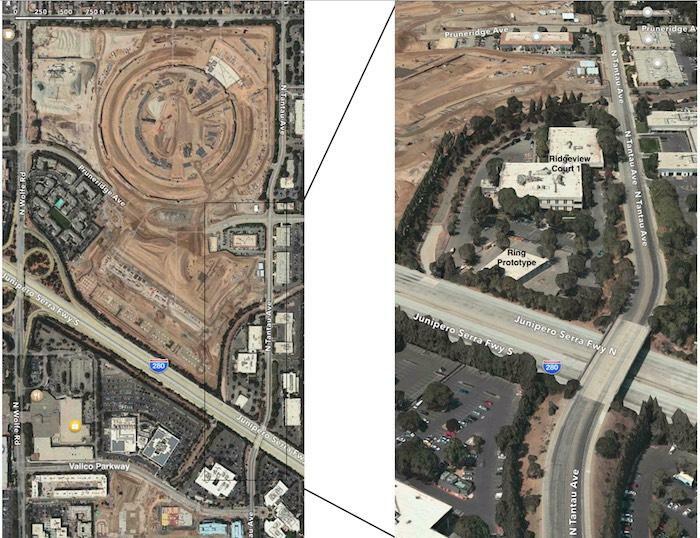 Over the past year, Apple used part of the former parking lot to build a mockup prototype section of the Ring for testing. That temporary structure was also removed over the winter, leaving a bare lot on a island of land separated from the rest of the Campus 2 site by Calabazas Creek. 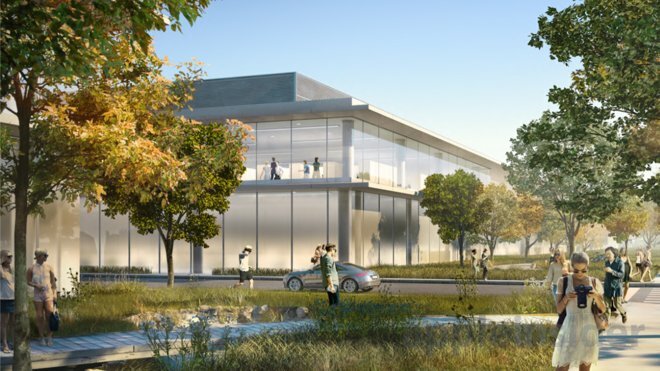 Across the street, a pair of two story testing facilities will provide 222,000 square feet of additional workshop and office space, replacing Apple's three existing buildings at the Tantau 1 and Tantau 2 locations and nearly doubling their existing 146,000 square feet of office space. 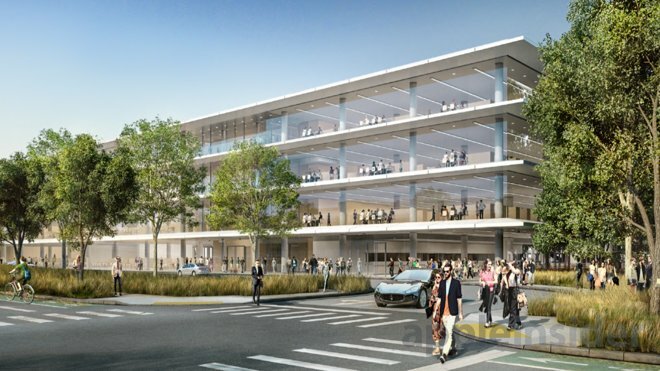 In place of the surface lots, a separate five story parking structure will provide room for 620 vehicles as well as a new 32,000 square foot data center located in the basement. Like the two much larger parking structures in Phase 1, this building will also feature a roof covered in solar panels to help offset its energy use, even prior to accounting for the separate off-site solar array the company is funding in rural Monterey County to the south. 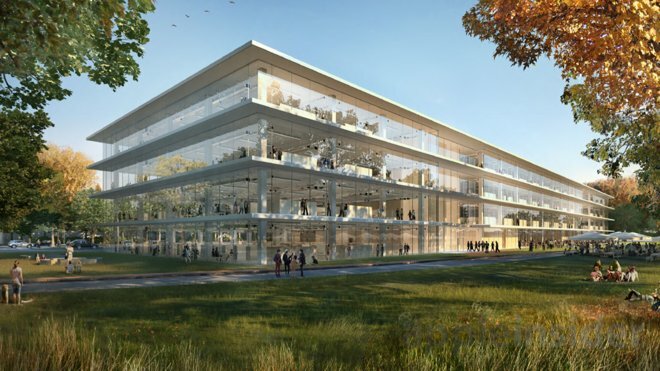 A third office building to the north of the creek will contribute another 84.000 square feet of space in a smaller two story structure of a similar design, at the location of existing Apple buildings at Tantau 3. The sites on Tantau border a residential neighborhood, separated by a wall and trees. The public Jenny Strand Park to the east, featuring a large open field and tennis courts, will be accessible from the Phase 2 buildings via a passageway. 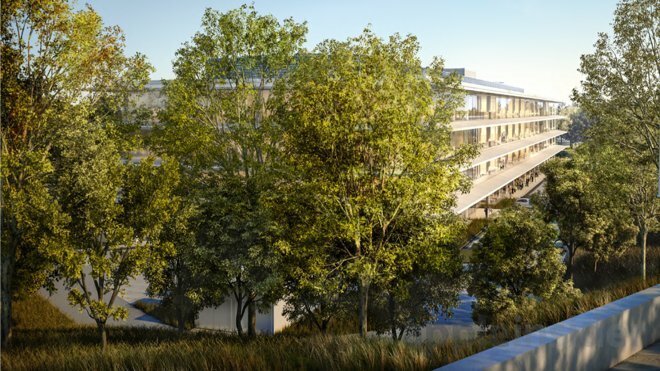 The new buildings will be stitched together by a boardwalk and landscaping featuring a variety of redwood, oak and other deciduous trees paired with sustainable ground cover designed to require minimal irrigation. 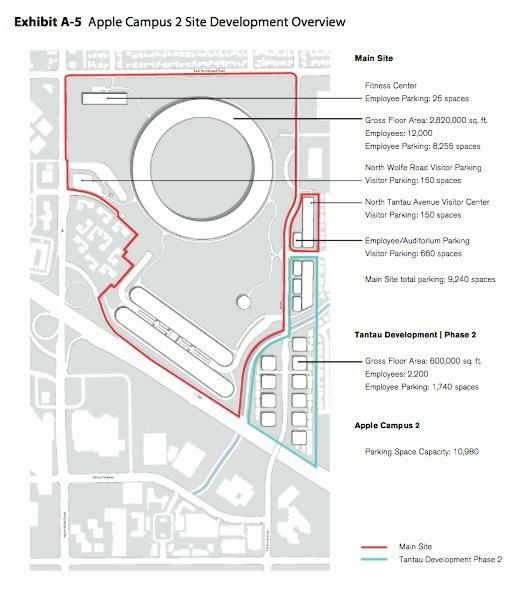 The R&D, testing workshop facilities and server data center of Phase 2 will complement the 2.8-million-square-foot "Spaceship" Ring designed to accomodate 12,000 employees, along with a fitness center, auditorium, transit center and other amenities. AppleInsider presented an exclusive video overview (above) of construction progress in our recent February Campus 2 report.